In a previous post, I referred to the multitude of quilt tops I had ready for quilting. Since I got the Qnique and Grace Frame, I may have quilted about 5 or 10 items. I hoped to have acquired expert status with this set up by now, but it hasn’t been like riding a bicycle. The brain and muscle memories haven’t automatically renewed every time I tried a new project. Each project has its own set of peculiarities! Since most of the pile (seven of them) consisted of table runners, I thought maybe I could pin several of them up to the Grace Frame, and quilt them all at the same time, and see how it went. This frame is supposed to accommodate fabric to make a king-size quilt. 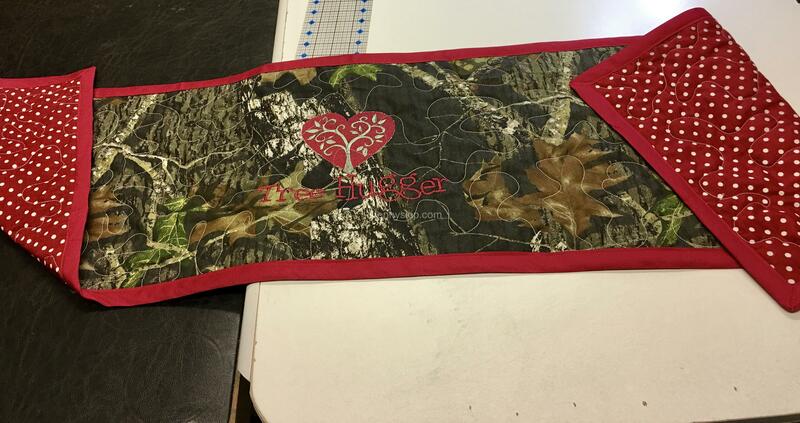 I was able to comfortably fit 5 of the 7 table runners across the width, with a little space in between each. 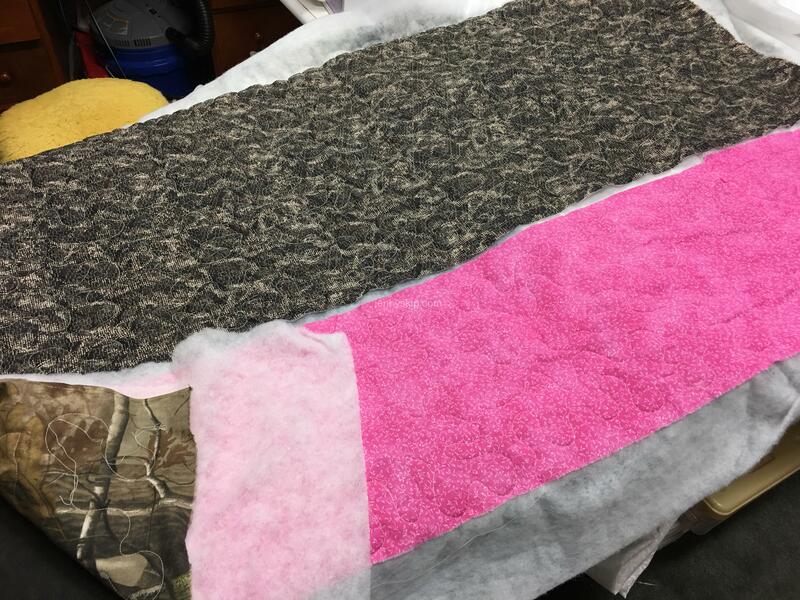 The backing is pinned (with the right side facing down) onto the first (top, furthest back) leader cloth, and to the second (center) leader cloth. I have marked on each leader cloth a mid-point. 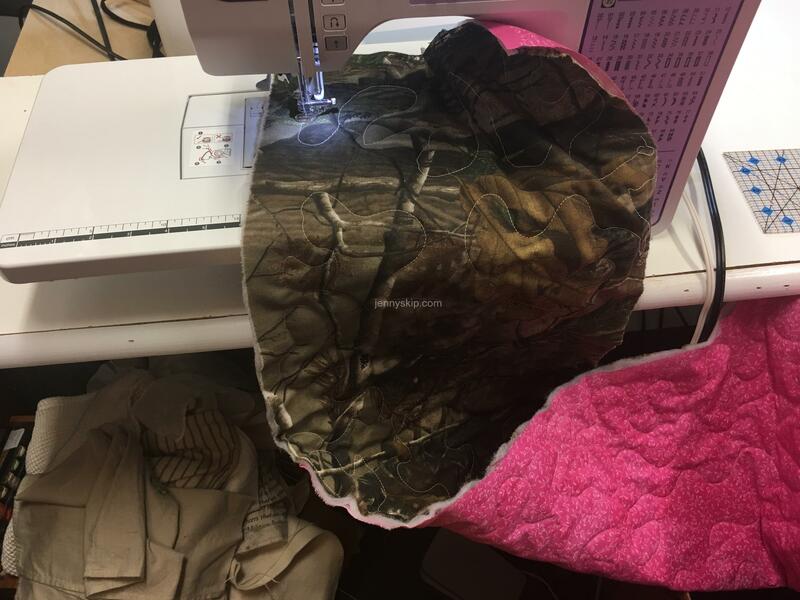 Normally I would fold the fabric of the top, bottom, and batting in half and pin that half-way point to the mid-point on the corresponding leader cloths. To match up the mid-points on all these separate fronts and backs of the table runners, I just counted the marks on the top leader cloths and lined them up with the marks on the bottom leader cloths. I realized later, that not all of the table runners were the exact same length, so that was one major problem with this set up! 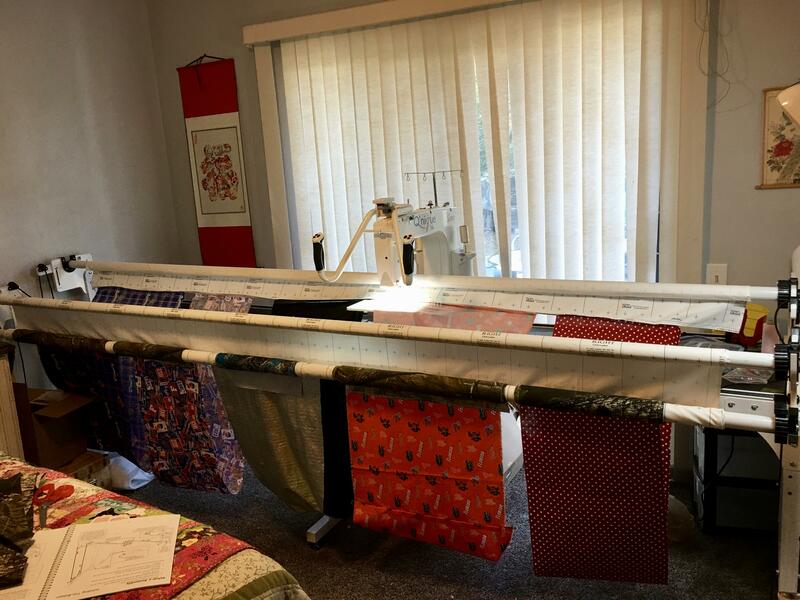 A while back I bought 2 big rolls of batting on sale, anticipating that I would be making a whole bunch of quilts. I use one of them most of the time, for the smaller baby quilts and lap quilts. 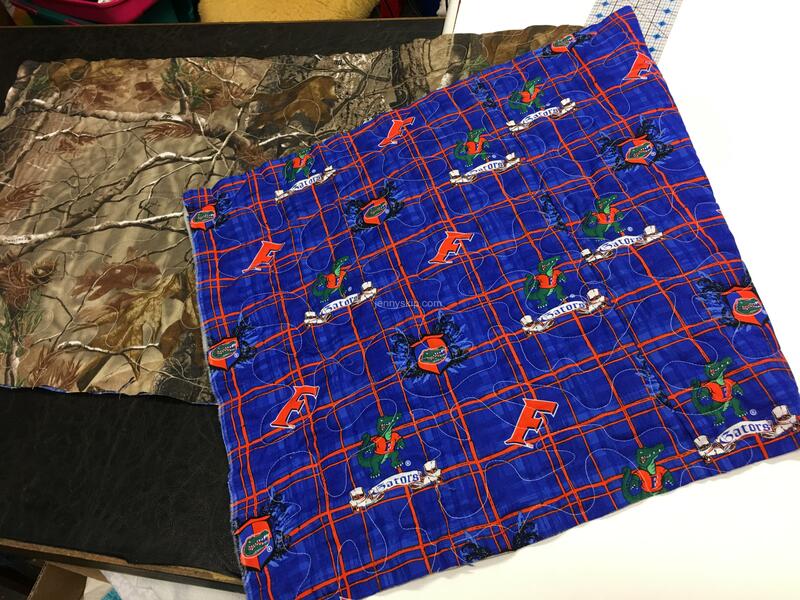 I can position the roll on the floor in front of the frame, and just roll out the batting up onto the frame as I am rolling out the fabric to be quilted. 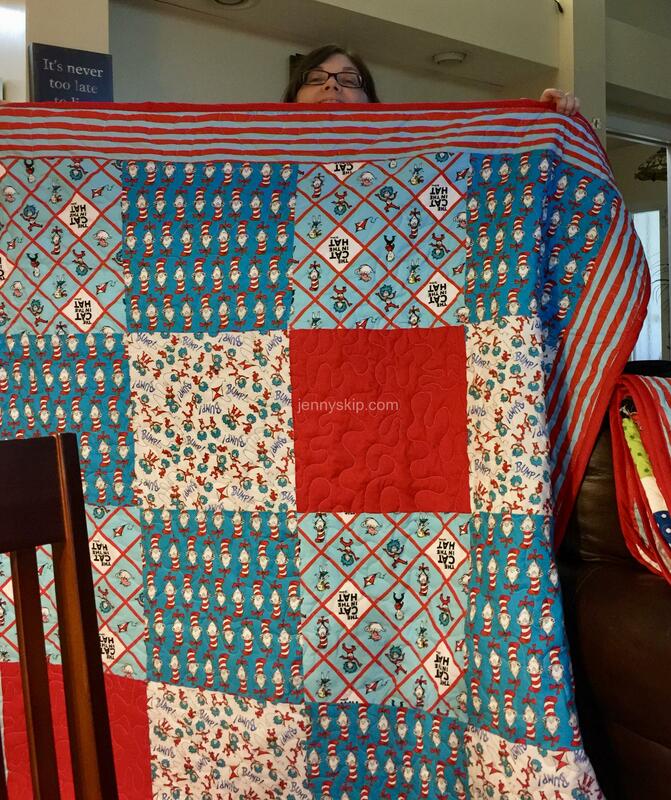 The one end of the batting layer is pinned to the backing, and then the quilt top is pinned to those two layers, forming the quilt sandwich. I actually purchased a fourth rail for the Grace frame, onto which the batting roll can be wound. One of these days I will find that fourth rail and install it. The second of the two batting rolls is for larger-sized quilts. The batting is folded double, and then wound onto the cardboard roll. So it doesn’t conveniently unwind from the roll like the first one does. You have to unroll the estimated length of batting, cut it off, and then unfold the large section of batting in half, and pin it to the backing. One thing I enjoy about the Qnique and Grace Frame set up is that pinning the fabric layers to the frame takes significantly less time than pinning the layers of a quilt for quilting on a home sewing machine. You pin the selvedge edge of the backing to Leader #1, then the opposite end to Leader #2, then roll it up on the rails, smoothing it out with your hands. No need for fifty-thousand pins with the little foam bobbers, or safety pins, or clips. However, in this case, since all the table runners were not the same length, and there were so many separate edges above and underneath the batting layer, a bit of mayhem ensued. All five pieces were conjoined in the batting layer, as seen above. But when the ruler base attached to the throat plate of the Qnique slid across to continue quilting the top next to it, it sometimes slipped the backing layer of its neighbor (underneath the throat plate) out of alignment, which wasn’t easily seen from the top side. And because all the tops and bottoms were of slightly different dimensions, some of the backing layers had a bit of slack, which wasn’t easily seen from the top, and which resulted in a few big puckers. DH (Skip) suggested that next time, I sew the edges of each runner together prior to quilting them on the frame. I don’t like that idea, because I feel that the seam ripper should be used for ripping out undesirable stitches that occur by accident, not on purpose. But, if I ever do 5 at a time again, it might be worth a try to see if sewing them together causes less shifting of layers. 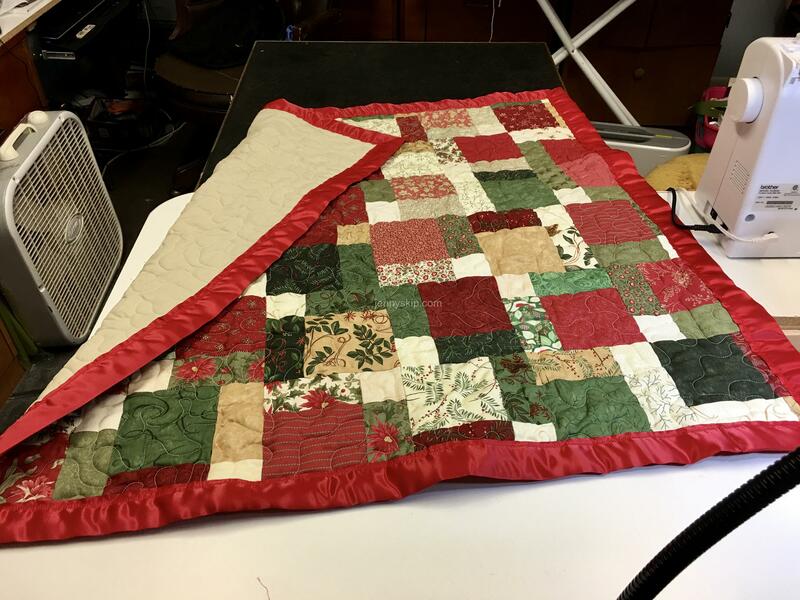 After the quilting, and cutting out the separate runners, and truing up the edges, I found that I would need to rip and redo several areas of quilting, due to puckers, overlaps, and other unsightly mistakes. In a couple of spots, when I slid the Qnique over to the next runner, the hopping foot got entangled in the edge of the top fabric and had to be cut loose with scissors. Sheesh. The worst shifting and puckering occurred in the inner three table runners. The outer two turned out with the least amount of rework needed, perhaps because the bungee clips which hold the fabric taut, are attached to the two outside runners. 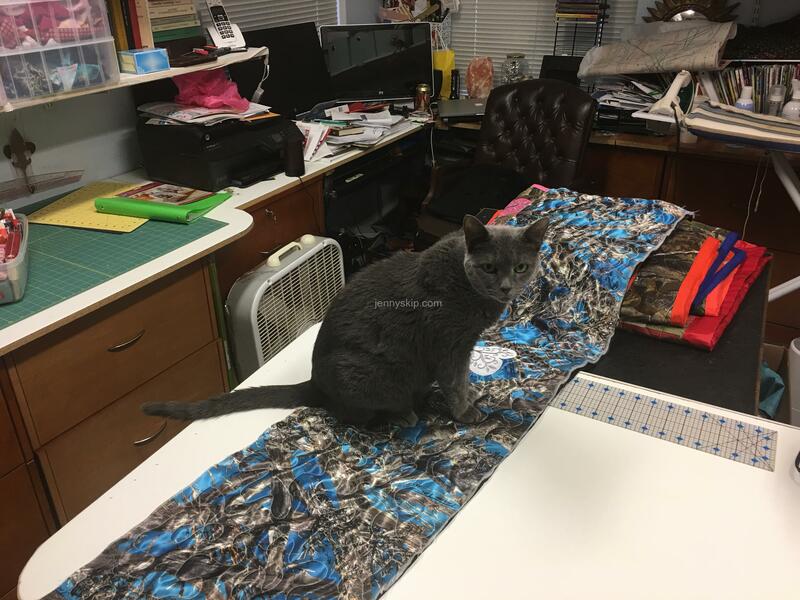 This is the reason for DH’s suggestion that all the lengthwise edges be seamed together for quilting, so that the tops and bottoms are one continuous piece of fabric during the quilting step. But I also feel that these errors can be chalked up to overall unfamiliarity with the process. 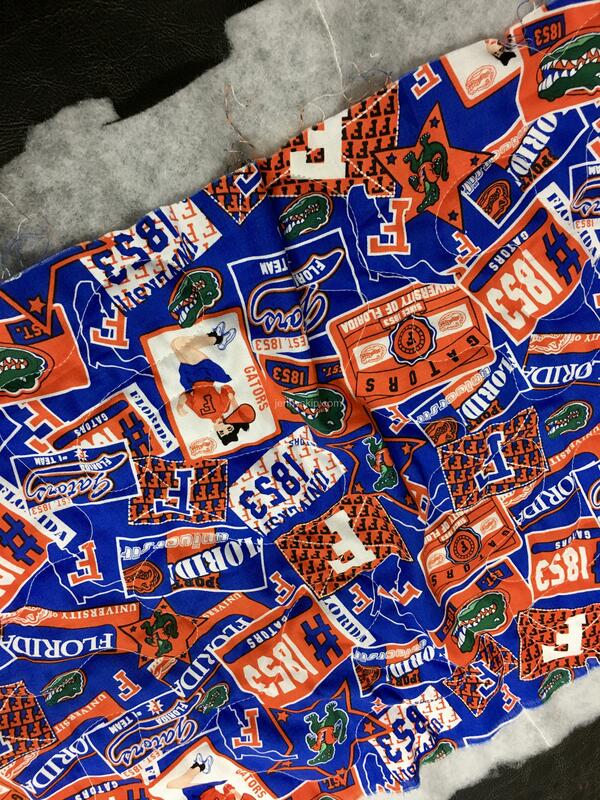 Perhaps they could be prevented in the future by smoothing all the fabric pieces, exercising extreme vigilance of the under layer, and perhaps installing the fourth rail and rolling the batting on it, thereby keeping the batting layer more taut and uniformly stretched out during quilting. Next pass, I pinned up the last two table runners to the frame. These, too, were of slightly different lengths, so one of them had some slack in it during the quilting step. I pinned them up closer together, practically touching, but I didn’t sew the edges together. I ended up with a couple of minor puckers and overlaps. 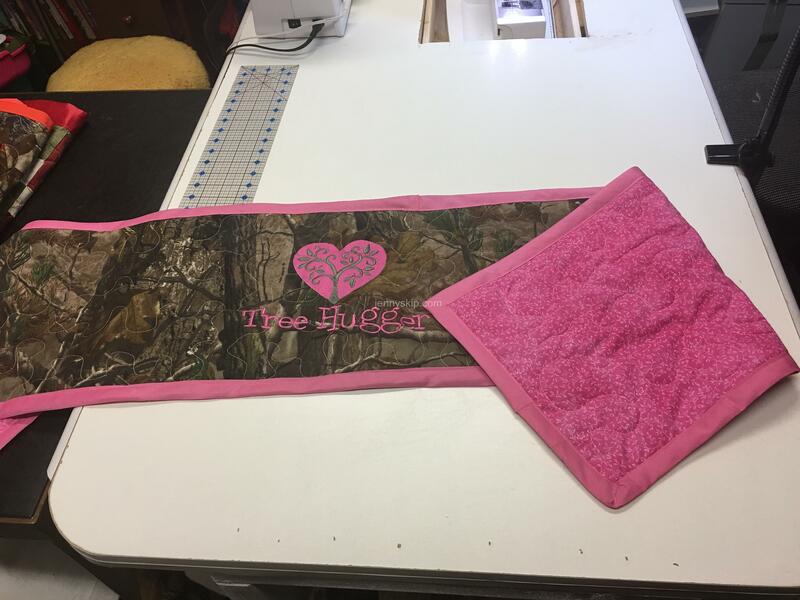 But the one with the pink backing, because of its additional length compared to the other one, had about a 5-inch space at the end that couldn’t be passed over with the machine, because its neighbor was already at the end of its quiltable area. 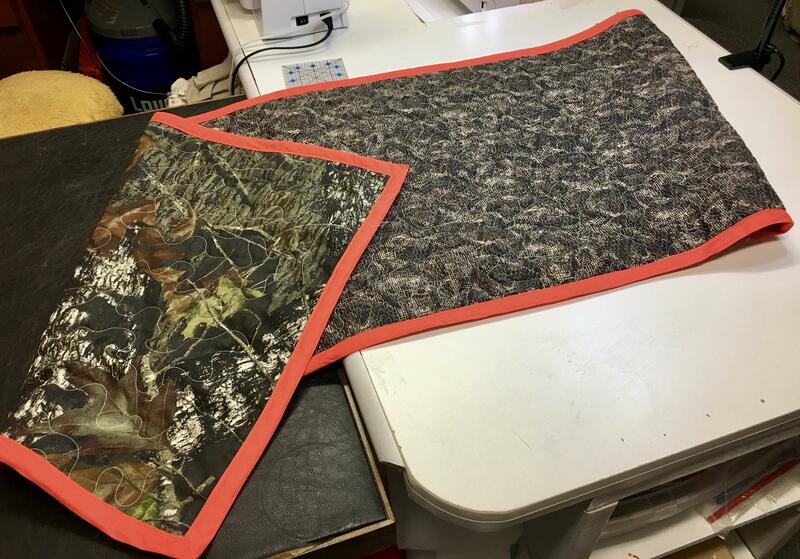 So this last little bit, as well as several areas on the previously mentioned runners that had to be picked out and re-quilted, were done on the Brother SC9500 with the free-motion hopping foot installed. BTW, that Brother is an awesome little machine, and very affordable! I did manage to get all the quilts (3) and table runners (7) finished, reworked if necessary, and bound. Here are a few pics of the finished items. The last one is not bound yet, because I couldn’t find anything in the stash right away that would make it “pop.” But the cats love it already. 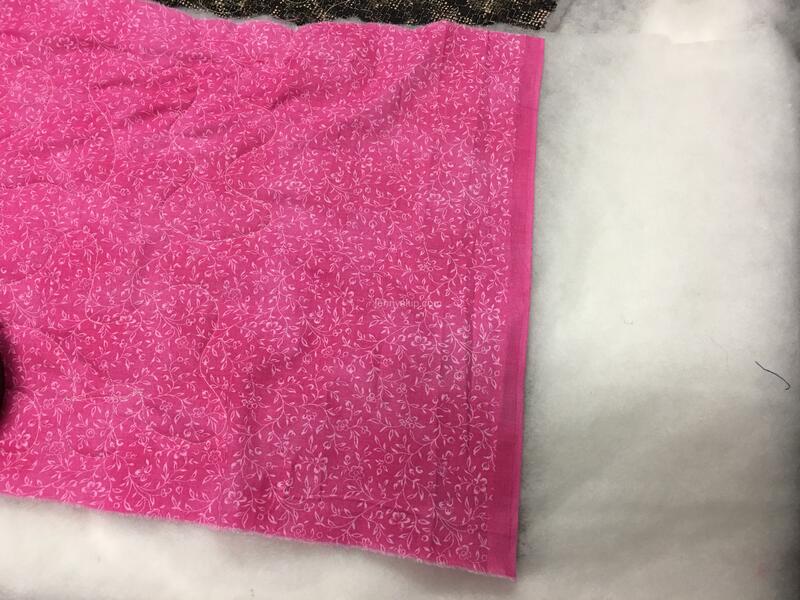 This is a slippery, satiny fabric that is possibly meant to represent snowy winter camouflage. For a backing, I used a silvery hologram-looking knit fabric. I love all of the camo remnants! 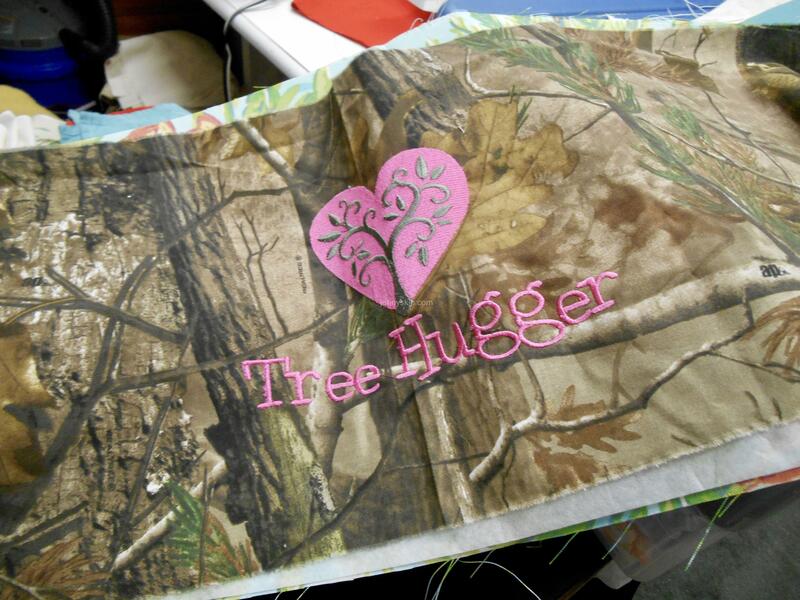 The Tree Hugger machine embroidery pattern came from Embroidery Library. So the Assembly Line experiment was not trouble-free, but it was an adventure! I applaude you for the trial and for not being to intimidated to try. Trial and errors are how we learn new techniques. 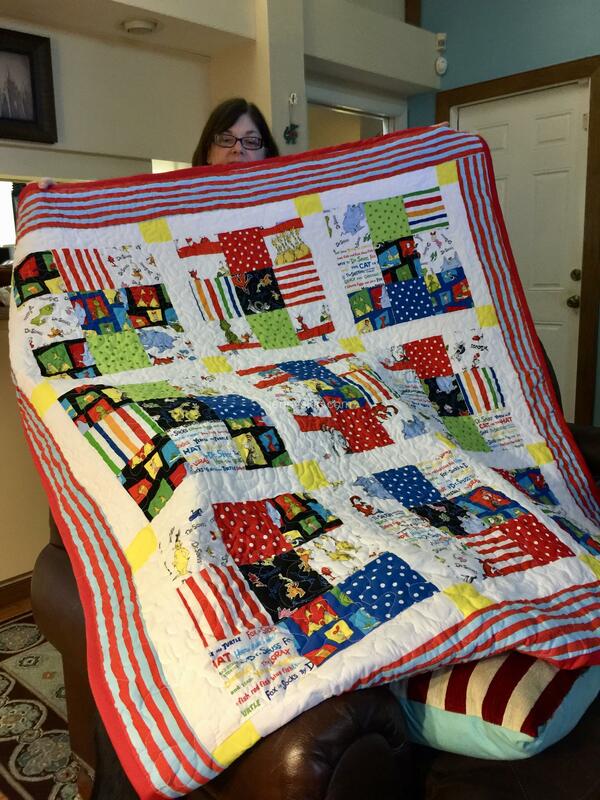 I hope you won’t mind a couple of tips from a seasoned longarm quilter. Hmm… how to explain it in words instead of pictures. You sew the backings together so that only one is worked on at a time. Not side by side left to right as you had them but instead side to side front to back. The length of each backing is right to left and the width is rolled up on the bar. Understand? The first backing on the bar should be the one that is shortest, the next one should be the next shortest, and the next. The idea is that the backing you start quilting first will be the longest with each consecutive backing getting shorter. I hope I explained that right. Each backing is sewn or pinned to the previous one matching center and there will be excess at each end. In this way all the backings are centered and are treated as one backing piece rolled up on the bar despite the differences in length or width. I sew them together with my household machine using a zig zag stitch at its maximum width and length and cheap thread. 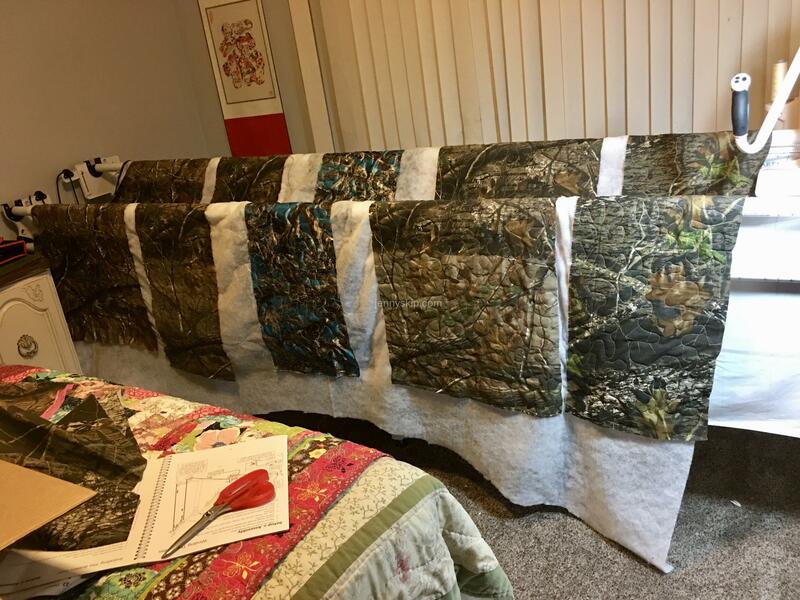 Its easy to get them apart after quilting. Next is your batting which is pinned as usual on the take up roller bar with the first (longest) backing. Your first quilt top starting edge is floated on top of the batting. In other words is not attached to the take up leader but may be attached and rolled up on the leader that holds your top. Pin it or sew it in place along and very close to the edge of the starting edge. Then quilt your first pass. Smooth the top down each time you advance it. 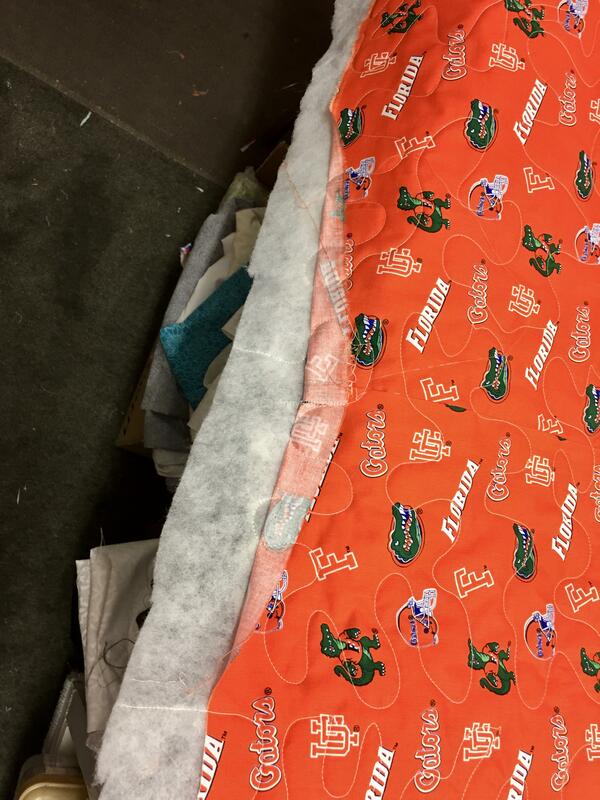 When you get to the end of the first quilt, unpin it from the leader to finish the quilting. When that quilt is finished you advance to where the backing is for the next top. Pin or sew it to the backing and batting as you did the first one. 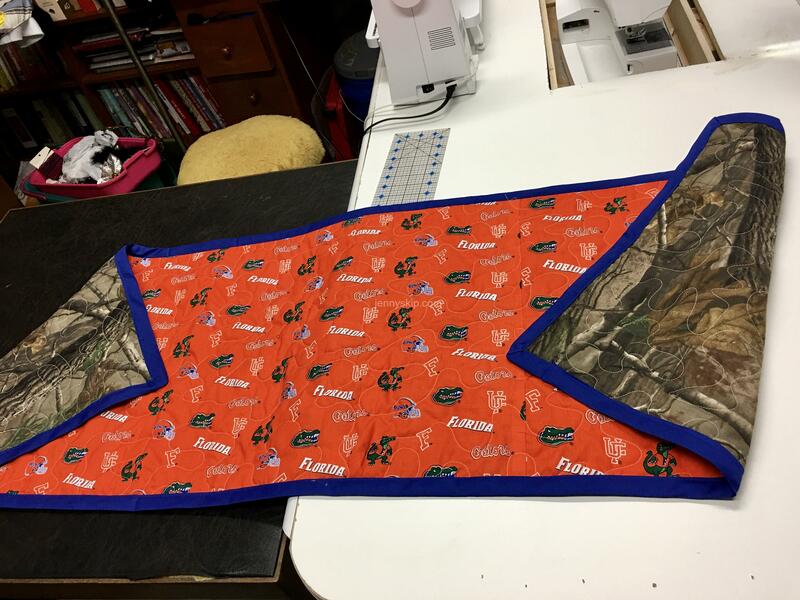 As you get to the end of the first backing you may need to put something to hold the excess fabric at the sides as you start the next floated top. I use my side clamps to hold it. I had instructions with photos for this on my blog but I couldn’t find it. May have been lost when I had to move from blogger to WordPress. I hope I explained it well enough? If not please let me know and I’ll try again. Once you figure it out you will be able to zip right through them. One word of caution though is to not load too many because it may get too thick for your machine harp area. Hope this helps. Happy holidays! Thanks Anita: I get the general idea, but when I get set up to try it, I will need to read your comment again, very slowly! And I will plan to try it some day soon…I appreciate your input A LOT! I did have a vague idea in my head of doing another experiment with the runners’ lengthwise edges going east-west on the frame. Now I’m looking forward to the next project! I commented on your blog’s “Contact Me” area to ask you about your seam ripper, did you see it? Just to ask if the heavy-duty seam ripper you like to use is available somewhere on line or in a store? Yes, and I did answer, did you not get the reply? I use one I bought at a fabric store. It has a magnifier that can be attached or removed. They are still available in JoAnn or Hobby Lobby stores and through Amazon. I’ve seen some that light up too for easier picking. I saw them at Walmart. And no, I didn’t see the reply on your site, and didn’t get a notice of any kind, would it have come by email? Didn’t find it, but thanks for the info, a magnifier and/or light would be great! Lovely! Thank you for liking my blog. A merry Christmas and a happy new year to you and yours!